Brian Herbert and Kevin J. Anderson will be doing a book launch for their latest Dune book, Winds of Dune, at the Merril Collection of Science Fiction, Speculation and Fantasy on Tuesday, August 18, 2009. 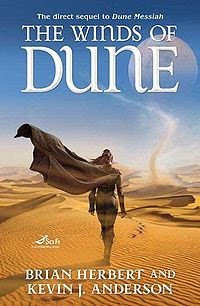 “Winds of Dune” is the second book in the four-part Heroes of Dune series, which chronicles events between Frank Herbert’s “Dune Messiah” (1969) and “Children of Dune” (1976). Books will be available (courtesy of Bakka-Phoenix Books) for signing by the authors. Kevin Anderson is a super nice guy, so I recommed attending the launch. I’m looking forward to meeting Brian Herbert, too. He’s one of the Writers of the Future judges I didn’t get to meet the year that I won. The Merril Collection is on the 3rd floor of the Lillian H. Smith library, 239 College St., and the book launch starts at 7 PM. And remember: for those of you who can’t wait until the 18th to buy your copy at the launch, Winds of Dune is available through booksellers everywhere as of tomorrow, August 4.